Do you ever get bored during the summer months? Why not beat some pesky branches off the trees in your backyard, Chop a log in half, or Split some firewood? If any of these activities sound enticing then the Fiskars X series axes are a product that can help. The Fiskars X series axes do not just look cool like a prop from the set of Total Recall they are also safer and more efficient than traditional axes with a blade designed to glide right through wood. 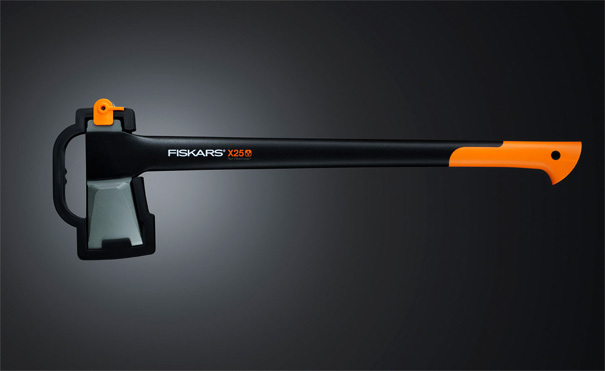 Fiskars makes an X Series ax size fit for any job, from the little 8 inch (20cm) X5 hatchet, perfect for your old ladies purse, to the 36 inch (91cm) X27 monster splitter, and many sizes in between. The Fiskars X Series has all the things that matter when shopping for a good ax. They have a sharp securely fastened and special faceted blade that's tough, and just the right weight. FiberComp handles designed for balance and vibration reduction. These things are a pleasure to use. The X Series are axes for the 21 century and may even last beyond that.